I’m very pleased to be involved in a great Blog Tour to celebrate the launch of a new Middle Grade book. and inspiring young eleven-year-old, Erik Weibel. Eleven-year-old Erik plans to eventually take over the world. Right now he’s a bit too young, so he is spending time as a sixth grade student, book review blogger and hopeful writer. Thanks for dropping by, I hope that you find my review helpful. For years the evil villain Wintergreen had tried to destroy super crime-stopper, Tomato and his sidekick, Pea, and take over planet Oarg. In a plan gone wrong, Wintergreen traps himself along with his arch-nemesis in a runaway rocket ship that crashes on a strange planet called “EAR-TH”. Now these perennial enemies must learn to work together to survive the dangers on this strange world. Hungry birds, enormous snakes and the giant inhabitants of EAR-TH stand between this brawling bunch of aliens and finding a way home. This story is about a group of characters who definitely aren’t the best of friends. Wintergreen is a bad guy. Tomato is a good guy. Both are Smidges (small critters who are only 3 inches tall), who live on the planet Oarg. These two have been rivals for ages, and Wintergreen has come up with a scathingly brilliant plan that will get Tomato out of the way – once and for all. Needless to say, all doesn’t go as expected and Wintergreen’s devious plan takes a turn for the worse. The result – they both find themselves in a strange place (Ear-th) where their old rivalries seem insignificant. They, and their posse of sidekick friends, have to learn how to put aside those differences and work together. After-all, their survival depends upon it. 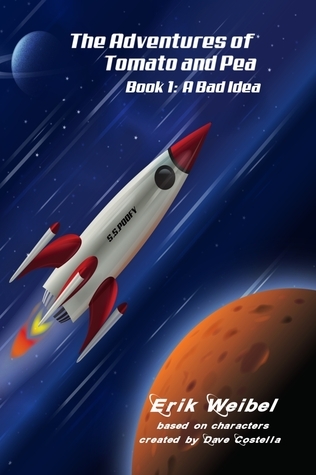 The Adventures of Tomato and Pea – A Bad Idea is the first book of the series. It does a good job at setting up the characters, and the underlying story. I expect that there will be plenty of future adventures exploring Ear-th while they try to find a way home. I really liked the range of different characters and look forward to learning more about them in the future. It’d also be great to see some illustrations of what they actually look like. I loved the humor that was injected throughout the book, especially Poppy’s fast and furious fact attacks. They provided an amusing balance to the book’s action. My bottom line: Well done on creating a story that kept me engaged from beginning to end. It’s so inspiring to see someone of Erik’s young age dedicated enough to take the plunge and write his first book. Keep on writing. A free copy of this book was provided to me by the author for a fair and honest review. 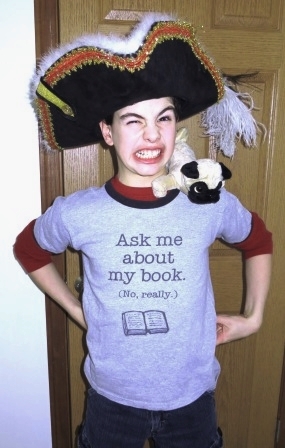 Erik is an eleven-year-old sixth grader that loves to read. 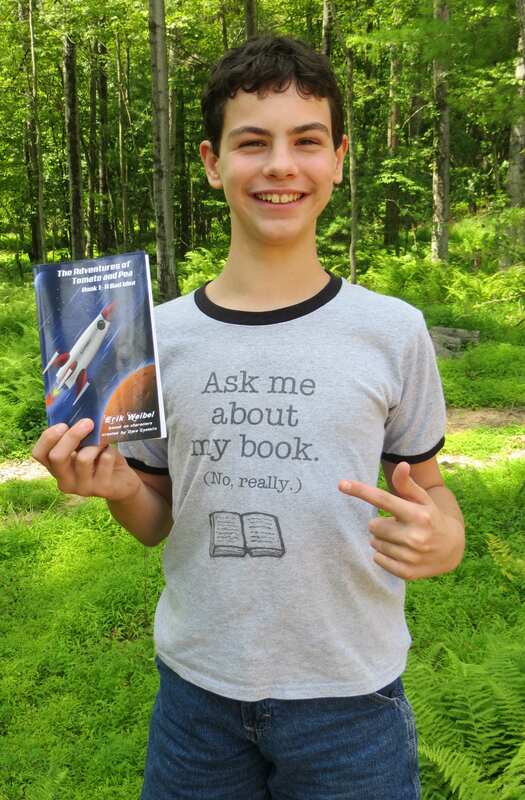 He started his blog, This Kid Reviews Books when he was nine. Erik writes a monthly book review column for a local free newspaper. He has a black belt in TaeKwon-Do and in his spare time enjoys building things out of LEGOs. He hopes to be an inventor and a published author when he grows up. While you’re here, please check out my edge-of-your-seat adventure series by clicking the pic below. End of The Tour. Boo-ho! I’ll miss ‘visiting’ with Erik every day! Good thing for me Erik blogs almost every day! Thanks for dropping in. Sounds like you are an Erik fan! Thank you Mr. Lothian! 😀 I really appreciate your thoughts! Now, I just need to go and get an illustrator… 🙂 Thank you for participating! I loved your book Erik. I’m very pleased to be involved in your launch tour. Excellent review. It sounds like Erik’s imagination really took over in this book. I can’t wait to read it; the reviews have been wonderful. Awwww… the end of the tour? It went fast. I think we missed a couple of stops – have to figure out those now. Great review, SW, for such a fun book! I suppose all good things (blog tour) must end. But I think it’s only the beginning for Erik, the author. Wow, 11 years old and you’re already taking on the publishing world! Awesome, Erik! Looks like great things will be opening up for you! Keep smiling and keep positive! Best wishes in ALL your worldly endeavors! Cheers! Sounds like a great story. I hope to read Erik’s book in the near future. I’ll be able to say I was there before he became a famous writer.